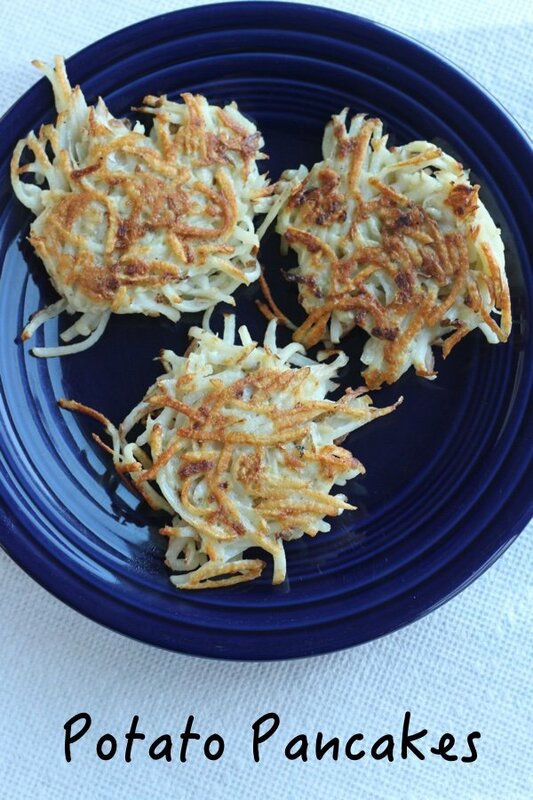 This potato pancake recipe is bit lighter than most and super delicious. I actually think latkes are a wonderful holiday food. Potatoes, onion, egg, and flour - there isn't anything but yumminess in the basic recipe. Of course, many will add sour cream when they consume them (which I do) but I also add applesauce which balances the dish (ha!). Latkes are nutritious when compared to Egg Nog, Christmas cookies, and candy canes. One latke has 24% of your daily value of Vitamin C - take that chocolate Santa! They are also easy to make and will disappear fast if you make the mistake of leaving the room after cooking them. I like these as much as my other favorite healthy potato recipe and these are faster. Other potato pancake recipes use zucchini, cauliflower, and sweet potatoes to lighten up the dish. These make a great, fast, easy and comforting last minute dinner. We served them with some chicken apple sausages. YUM! 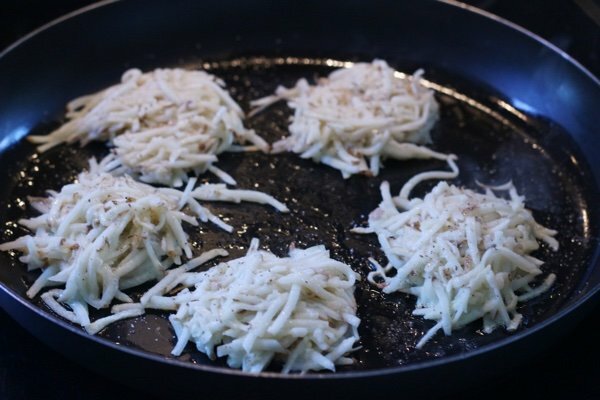 Do you have a tip for a lighter potato pancake recipe? Please share. Fill your palm with the potato mixture and pat into a 2 inch diameter circle. Put four pancakes into pan and cook until brown on both sides (about 3 minutes per side). After you remove the first batch, add one tablespoon oil to cook the next batch. Repeat with all of the batter. We celebrated Hanukkah with family friends when I was growing up and we tasted Potato Pancakes paired with Homemade Applesauce. I would use unbleached flour and a sprinkling of salt, but looks great! Why not use hash browns? In my new quest [10 weeks now] to cook fat-free plant-based, I’ve been looking for satisfying substitutions for old favorites and new dishes. These look amazing and my first inclination was to eliminate the egg and cook them in my waffle-iron using a quick mist of coconut oil. Then a web-search popped up a FF vegan version that baked them with seemingly crispy results plus good old parchment paper for easy clean-up. 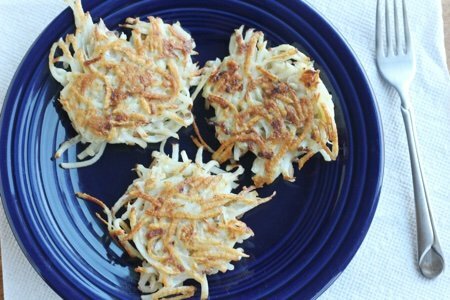 [https://www.plants-rule.com/blog//the-ultimate-baked-latkes-how-to-make-healthy-gluten-free-vegan-oil-free-jewish-potato-pancakes] It intrigues me because, if true, this could be a more frequent and healthier side dish that my whole clan would like. For dairy-free, I found a nut-based ‘cream cheese’ this past week which is very close to the real thing. My list of vegan foods to try is growing. Thanks, Lisa! Love the variety of ideas you keep coming up with! I refer to latkes as "organized hash browns" and know I've baked them, and even fried with much less than the typical amount of oil (with good results - just experiment). The smell of all that oil is a real deterrent for me - I don't like my hair, clothes and house smelling like a fryer! It is fun to throw in some sweet potatoes, zucchini and/or carrots for color. I'm looking forward to the Hanukkah party at my new job - the boss is said to make the best latkes ever, and that will be my fix for the year! I put a baking sheet in the oven at 450, while I prepare the latkes. When the latkes are ready to be baked, I take out the HOT baking sheet and spray it liberally with olive oil spray. Spoon the latkes onto the baking sheet - they will sizzle! Put back in the oven for 8 minutes. Take the latkes out, spray the tops with olive oil spray, flip the latkes and return them to the oven for about 10 minutes. The goal is to get both sides brown and crispy. While some variations part from tradition, I like the nutrition advantages of adding other shredded veggies and baking the latkes. Good idea Emmy, will give it a try! I love latkes! I think I will give this a try in the air fryer that my dear Husband bought for me. Might be able to do it without any oil or just a squirt of cooking oil spray like Pam. These are far from traditional potato pancakes. 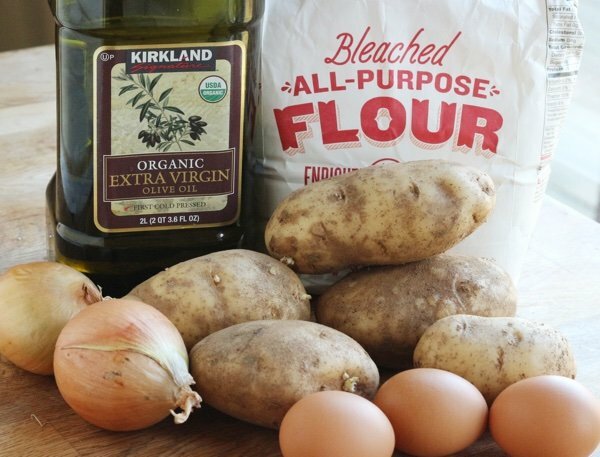 Matzo flour needs to be used along with egg, potato and onion. We get the packaged in the Jewish food section of the grocery store. Just add water no oil. These are traditionally what is served in restaurants that specialize in Jewish foods. Everywhere I have had them, they are the same. If you make them from scratch, get a better recipe. The food needs to be pulverized and made into a better pancake consistency. I serve mine with applesauce which is traditional but hubby likes them with butter. Have them out at a restaurant that specializes in Jewish foods, if you can, to see how they are really made and how they taste. Grating the potatoes on a 4-sided grater, large size, is the right consistency. Pulverizing makes the insides like mashed potatoes with no chew. Smooth is for Goyem. Mom didn’t use matzoh flour but used matzoh meal. I never gave thought to what it was other than ground matzoh. I’ll ask when I see her on Sunday. BTW it is spelled goyim not goyem. Even Jews find this term offensive and divisive. Well latkes are a very important tradition for my family, and I was delighted to see Lisa's helpful take on a healthier version, as well as all the great comments. These suggestions help us all make more informed, healthy decisions without sacrificing taste. The last comment on this post, however is totally outside the parameters of the spirit of Lisa's vision as she states it. There is nothing racist about the Yiddish word for Gentiles. First, there is no right or wrong spelling; just like Chanukah, Hanukkah. Any translated word from the original language can be spelled any way in another language. Second, being fluent in both languages, I am aware of how the term is most often used. Growing up in NYC, this is a common term used by multiethnic people. The author of the original comment was being helpful concerning the preparations of latkes, and I immediately understood what she was saying, much like "Jewish" style rye bread differs from white bread. 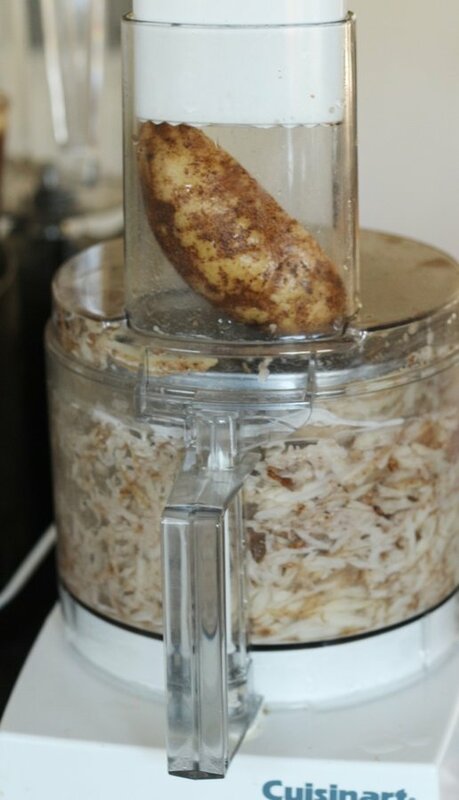 If you want to prepare traditional potato latkes, texture matters, and coarse potato grating is correct. In any case, can we all try to keep the comments on topic? We want to help each other prepare delicious healthier foods. That's the reason people subscribe to Lisa's website. I’ve never heard Goy or Goyem used as a racial or ethnic put down. My meaning was that non-Jews use flour or cracker meal as they aren’t familiar with matzoh flour. Nancy understands I wasn’t being rude or demeaning. If texture is lost, it becomes a ground potato cake. Traditional latkes have a good chew factor. Plus I remember helping Mom and the scraped knuckles you’d get. Oy! I can’t eat white potatoes but am wondering if sweet potatoes would come out the same. More sugar content so they’d burn quicker, but I’m thinking of baking them for less grease and crispy texture. The comment on goyem was made by a Jewish man, Evan Kenyon. I know and have known many Jewish people and the use of this word is used in an insulting way. I am personally insulted when this word is used referring to anyone who is not Jewish. Gentile is the more accepted term or non-Jew. For Nancy Cole. Are you a moderator for this site? Are you the spokesperson for Lisa? Lisa did not use this term. Do you know any Jewish people? This term is pejorative and I felt personally insulted. I don't care where you grew up. I lived in Los Angeles for many years and had several Jewish boyfriends and friends and was engaged to a Jew who attended law school. My father worked in and industry which was predominantly Jewish. This should be a learning experience more important than a recipe. My purpose was to educate not vilify Lauren for using the term. I am going to weigh in (your moderator here) and say that I think that this discussion is a good one and has remained respectful (if a bit angry but that is okay). It may depend on where you grew up and how it was used in your corner of the world. Thank you for weighing in Lisa. In addition to Wiki, I suggest looking at sites such as Quora or other sites frequented by Jewish people to see how many of them weigh in. Thanks again, Merry Christmas from a gentile.